Saturday’s New York Times exclusive about Donald Trump’s $916 million tax loss in 1995 and its potential implications for how much federal tax he paid (or didn’t) for years afterward sent conversation about taxes soaring on Twitter. Here at the Laboratory for Social Machines, part of the MIT Media Lab, our Electome project has been tracking the Twitter conversation about the presidential campaign since early 2015. Our algorithms pull all election-related tweets — hundreds of thousands per day — from the full output of Twitter and classify them according to topic, candidate, and other relevant filters. The result is a timeline spanning the entire campaign of which issues mattered most (and least) to the Twitterverse. 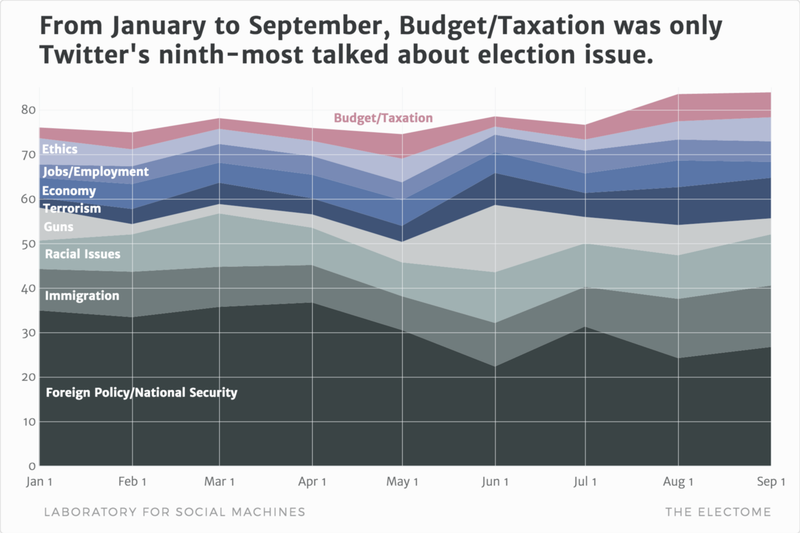 Budget/Taxation (in pink) averaged only 4 percent of the issue-related election conversation from January to September. Foreign Policy/National Security averaged 30. The issue of taxes, captured under the rubric Budget/Taxation, has not played a prominent role in the election conversation until now. 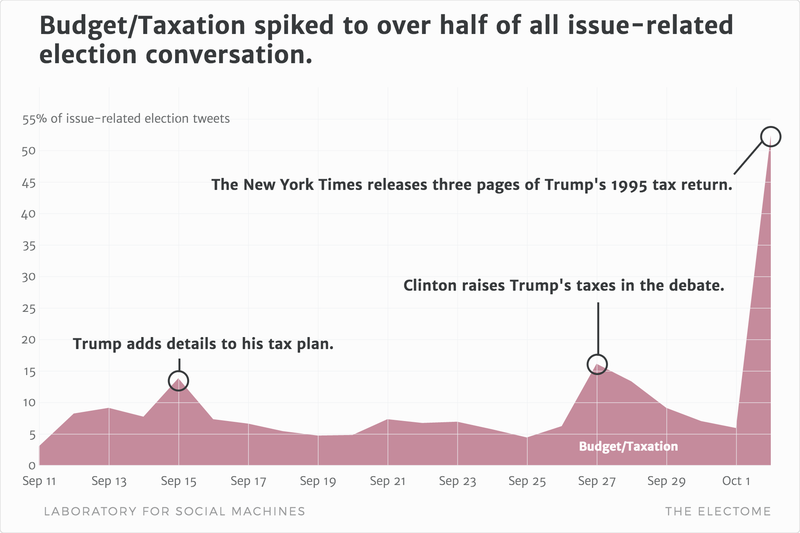 From January 1st of this year to the eve of the first presidential debate, for example, talk of taxes averaged just 4 percent of all issue-related conversation. By comparison, 30 percent of issue-focused tweets involved Foreign Policy/National Security. 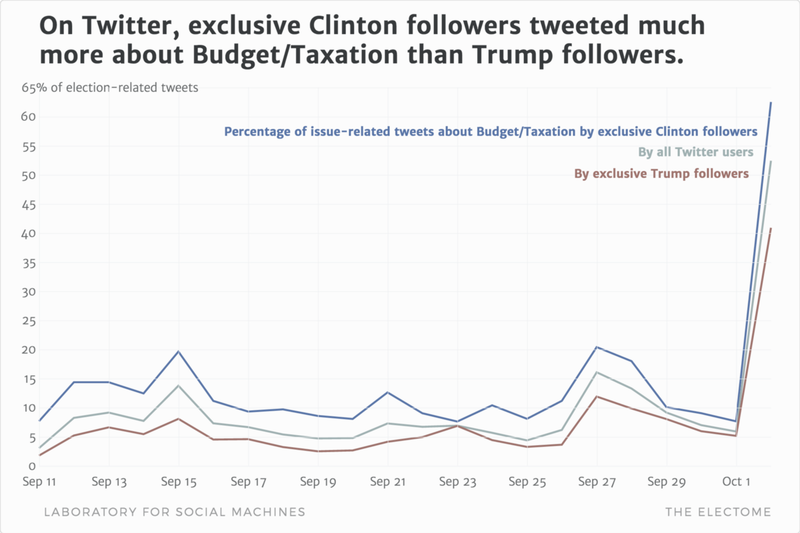 Hillary Clinton prominently pressed the issue of Trump’s taxes — why he hadn’t shared his returns and what that might mean he has to hide — at the first debate on the 26th and helped drive the issue to second place on the Electome chart: on the 27th, 16 percent of issue-related election tweets were categorized Budget/Taxation, compared to 26 percent that were categorized Foreign Policy/National Security. The spike didn’t seem as though it would last. Two days later, tax talk was down to 9 percent of all issues that the Electome tracks. Then the Times report came out. 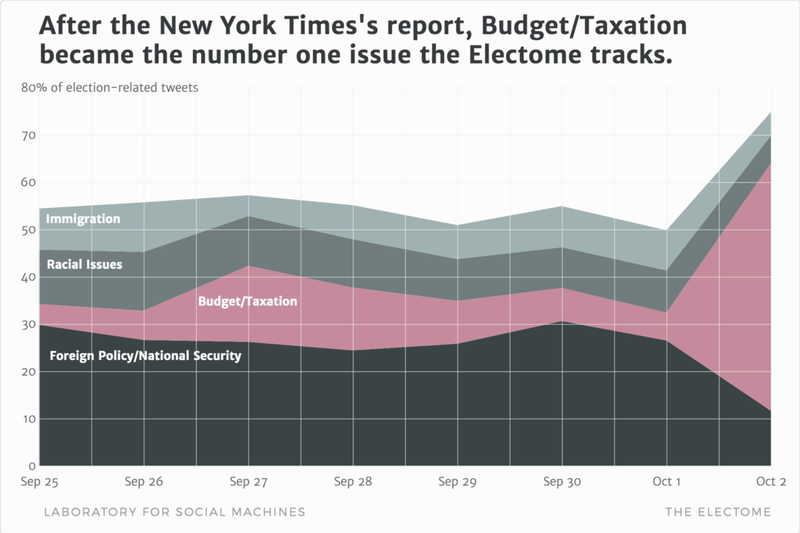 The results were dramatic: by the next day, more than half the issue-related tweets—a whopping 52 percent — were about taxes. That’s more than national security, race, and immigration combined. We at the Electome often see one- or two-day spikes in interest in election issues or terms, but we have never seen an issue that accounted for just 4 percent of all issue-related talk jump to over 5o. As we noted with the tax discussion after the first debate, and as we’ve observed countless other times throughout the campaign, typical spikes don’t sustain for long. But there’s nothing typical about this spike. If you want to stay abreast of our findings, be sure to sign up for our newsletter, check out our dashboard, and follow us on Twitter. Andrew Heyward and John West work on the Laboratory for Social Machines’s Electome project. Soroush Vosoughi and Prashanth Vijayaraghavan, researchers at the Laboratory for Social Machines, developed the analytics for this post.